I received exciting news this week from Kacy Andrews that Bigfoot Ascendant inked a 2-year Broadcast/VOD deal with Chinese based Royal Sea Media/Manson Media Intl. 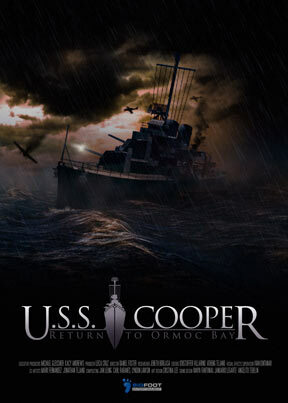 for Bigfoot Entertainment’s USS Cooper, Return to Ormoc. You can find more information on this feature documentary at the USS COOPER website. USS Cooper was part of Bigfoot Entertainment’s original slate viagra sur internet. It went on to receive a “Best Documentary” nomination from the Asian Festival of 1st Films in Singapore. Kacy went on to say that Bigfoot Ascendant will do a re-release in the US on Veterans Day (11.11.11) via iTunes. This show is great for those interested in WWII, water battles, deep wreck diving and anyone who loved HBO’s series THE PACIFIC. As the Executive Producer, I am bias when saying I like the show…but more than that I really did appreciate working with Leica Cruz as she put the show together, Daniel Foster’s storytelling craftsmanship and Rob Lalumiere’s commitment to a risky dive, and respect of those sailors on the USS Cooper and Hank Wagner, one of the survivors that re-visited the site of his ship’s tragic end. An unexpected addition came during post with Mark Amberville’s heartwarming score…a bit of added value that rounded out a well crafted production. I hope you have the opportunity to check this project out.